TMK | Super Mario's Release Date is Missing! Super Mario's Release Date Is Missing! While Nintendo of America seems quite happy to give Super Mario Bros. a publication date of October 18, 1985 (as seen on the Virtual Console service, its NES game listing, and in other places), not all gaming historians seem comfortable with that date. In The Ultimate History of Video Games, Steven Kent states that "[w]hen Nintendo went to New York, Super Mario Brothers, which would become the linchpin during the national launch of the NES, had not been introduced,"1 later explaining that "the cartridge was available by the time Nintendo of America went nationalthe end of 1986. "2 Chris Kohler's Power-Up: How Japanese Video Games Gave the World an Extra Life also gives the game a 1986 release, simply noting that "[t]he US version of the Famicom, renamed the Nintendo Entertainment System, launched in New York City for Christmas 1985 with games like Duck Hunt, Wild Gunman, and Donkey Kong, but not Super Mario Bros., which arrived in 1986. "3 Multiple Wikipedia discussions have spawned debating the actual release date of Super Mario Bros., but no conclusive answers seem to have been drawn. With the actual release date of Mario's first sidescrolling adventure remaining such a mystery, we at TMK decided that something had to be done. After all, how could we properly celebrate the 25th anniversary of the release of Super Mario Bros. if we didn't know exactly when that anniversary might be? Milwaukee Journal, October 5, 1985. Off to the search engines and databases we went! Preliminary Internet research seemed to reveal little new information, until another staff member directed me to Milwaukee Journal article from October 5, 1985.4 In his video game column, Edward J. Semrad previewed Nintendo's then-upcoming NES, giving the names of 15 launch titles as well as several scheduled for release in 1986. The initial lineup, as stated by Semrad, consisted of two packed-in games (Gyromite and Duck Hunt) as well as fifteen other titles: 10-Yard Fight, Baseball, Clu Clu Land, Excitebike, Golf, Hogan's Alley, Ice Climber, Kung Fu, Pinball, Soccer, Stack-Up, Tennis, Wild Gunman, Wrecking Crew, and Super Mario Bros. While this might initially seem to answer the question, the article in question was only a preview of an upcoming system; games get delayed all the time. It does, however, hint that Nintendo may have been planning to release Super Mario Bros. with the NES. Further research was required. Macy's NES ad, November 1985: No DK Jr. Math, no Mach Rider. Even with these two different pieces of evidence, it's still possible that "Super Mario" was merely planned for release. Nintendo's advertising team, led by Gail Tilden, may have been expecting Super Mario Bros. to be ready in time for the Christmas season, and designed the Macy's ad to reflect that. Further evidence was necessary, but we were unable to locate any. Perhaps the game was delayed until the 1986 "national" launch, after all? 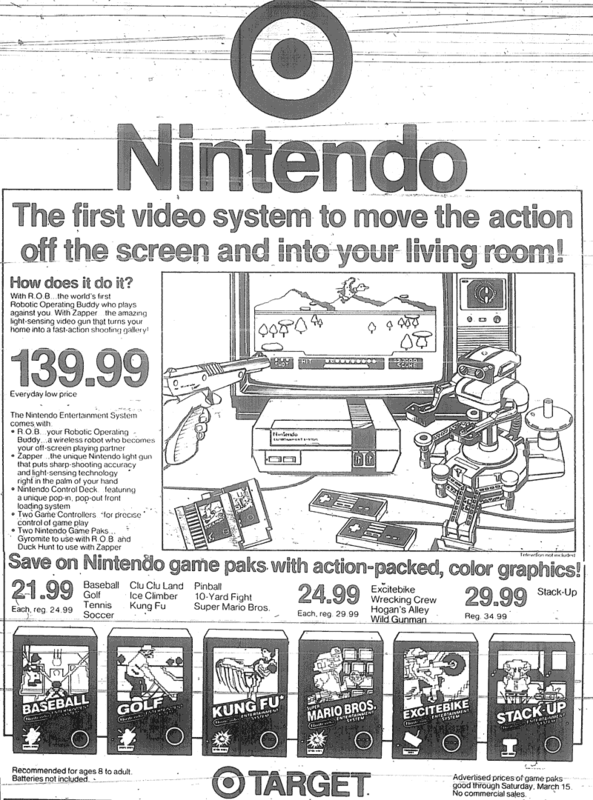 Rather than give up, I looked for the next known ad referencing the NES's titles, and managed to find a Target ad in the March 13, 1986 Los Angeles Times. All fifteen games were once again listed, including Super Mario Bros.6 However, March of 1986 was well before the national launch of the NES; instead, this represented the second limited test of the NES, in the Los Angeles area.7 At the very least, then, it seems fair to say that Super Mario Bros. was released prior to the national launch in mid-to-late 1986, contrary to Kent's Ultimate History. "You are making me second guess myself as well. I would have said yes, but my memory says there were 15 games at launch, plus the two pack-ins. [Wikipedia] has them listed and it seems to be correct. Which would mean Mario followed very shortly thereafter." While Tilden's response wasn't what we were hoping for, it seemed nice to have some closure. Super Mario Bros. must not have been part of the NES launch thenor was it? A quick perusal of the Wikipedia's NES page showed the list of list of 17 games (15 plus two packed-in titles) as 10-Yard Fight, Baseball, Clu Clu Land, Donkey Kong Jr. Math, Duck Hunt, Excitebike, Golf, Gyromite, Hogan's Alley, Ice Climber, Kung Fu, Mach Rider, Pinball, Stack-Up, Tennis, Wild Gunman and Wrecking Crew, citing Super Smash Bros. Brawl as the source.8 However, the list has two mistakes: Donkey Kong Jr. Math wasn't available until at least mid-1986 as part of the national launch, and neither was Mach Rider. Both have U.S. Copyright Office instruction booklet publication dates from 1986, and (significantly) neither are included in either newsprint advertisement. What's more, Semrad's preview article lists both titles as coming in 1986. If Tilden was correct as to there being 15 launch titles (aside from the packed-in Gyromite and Duck Hunt)9, eliminating Donkey Kong Jr. Math and Mach Rider leaves two titles missing. One of them is clearly Soccer, present in all launch print ads and the preview (but, strangely, listed in NOA's internal databases as appearing in 1987 for some reason). The other? Well, it can't be a classic arcade portthose didn't arrive until mid-to-late 1986. The only title left is Super Mario Bros.! While researching Copyright Office listings, another interesting fact came to our attention: while most of the 15 NES launch titles have October 18, 1985 listed as their date of publication (generally, the first day the article in question was available for sale to a wholesale retailer and/or the general public), the manual for Super Mario Bros. has a given publication date of October 31, 1985. (The game itself has a publication date of September 14, 1985.) In theory, the Copyright Office's date of publication data should be correct, but there are occasional discrepancies between when a title is regarded to have been released to retailers and when it is actually available to the public. Of course, there is still the chance that the game was never released at all during the NYC run, even though it was planned for it. However, there is evidence to suggest that the NES versions were being produced, at the latest, in mid-October. A poster over on the Nintendoage forums managed to find a SMB cartridge with chips marked as being produced during the 42nd week of 1985.10 These cartridges should have been available for the L.A. launch in early 1986, but there is a strong possibility they would also have been available during the Christmas season in NYC. At first, this appeared to deal a crushing blow to all our research, but it seems difficult to reconcile this statement with two different print ads listing the game for sale, a preview article specifically listing it in the upcoming launch, and Tilden's memory of 15 launch titles. It's possible that the trio were either referring to the game not being available at launch (but a few weeks afterwards), or not being available until 1986 (during the L.A. launch). There is also a chance, however slim, that some confusion was made between Super Mario Bros. and Mario Bros., which certainly wasn't available until the 1986 launch (along with Donkey Kong and other classic arcade ports). The game was released on October 18, 1985, along with the other launch titles and the system in a limited number of NYC stores. However, this appears to be contradicted by the copyright office's DOP. The game was released on October 31, 1985, the date of the manual's publication. The game was planned for a launch release, but not actually available until some unknown point between October 18th and mid (to late) November 1985, as seen in the Macy's ad. The game simply wasn't available until the L.A. launch in 1986. While the actual launch date of the game remains an open question, it seems most likely that it was released during the NYC launch, between October 18th and November 17th of 1985. While we can't be certain of a release date prior to the Macy's advertisement on November 17th, I'm inclined to accept October 31st as the most likely release date of the title, given the Copyright Office's DOP for the SMB manual and Tilden's memory of SMB being present during the NYC launch. The investigation will continue, but feel free to celebrate the 25th anniversary of Super Mario Bros. for the next 30 days! Frank Cifaldi over at 1UP.com recently posted an interesting article about the launch of the NES. 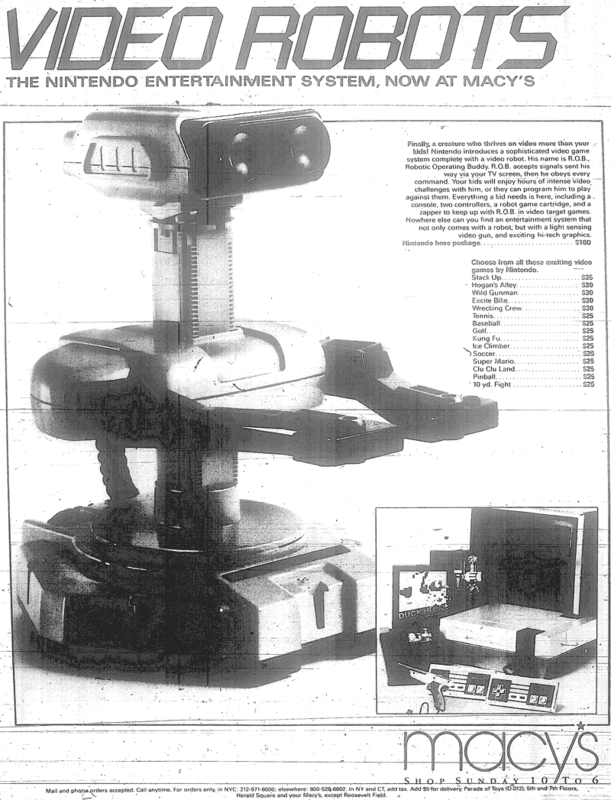 Along with interviews with several members of the Nintendo launch team, the article includes a picture of the R.O.B. point of purchase display12. The R.O.B. display, although somewhat hard to see, appears to perfectly match the list of launch titles as found in both the NES preview article and the Macy's ad mentioned earlier in this feature. It's worth noting that the 1UP article appears to use the incorrect Wikipedia list of launch games, listing Mach Rider and DK Jr. Math as launch titles, instead of Soccer and Super Mario Bros. Both of the latter titles are present on the R.O.B. display. 1 Kent, Steven. The Ultimate History of Video Games. October 2001: 297. 3 Kohler, Chris. Power-Up: How Japanese Video Games Gave the World an Extra Life. September 2004: 62. 4 Semrad, Edward J. "New Nintendo system way ahead of the field." The Milwaukee Journal, October 5, 1985: Green Sheet 2. 5 The New York Times, November 17, 1985: 29. 6 Los Angeles Times, March 13, 1986: 24. 7 Kent: 298. "In February, Arakawa expanded his test to Los Angeles." 9 The presence of 17 launch titles seems confirmed by Howard Lincoln himself in Ultimate History: "But there were seventeen cartridges created, including Super Mario Brothers, Baseball, Tennis, and Golf." Kent: 306. The Mushroom Kingdom \ Super Mario's Release Date is Missing!